The ribbon is cut for Twining Village’s new memory care neighborhood. Twining Village has opened it new memory care neighborhood. Located in the Holland, Pennsylvania, senior living community’s personal care building, the memory care unit provides secure, memory-focused support for personal care residents. The new unit was developed within the overall personal care community, with changes having created a unit serving 25 people with memory-related illnesses such as Alzheimer’s disease. Memory care is provided in a secure unit, with consistent staffing and specialized programs to support maintenance of as much memory-related faculties as possible. Activities, music and other programming are geared toward supporting memory. 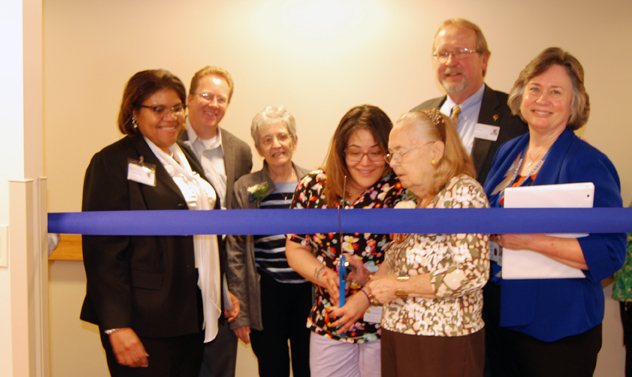 The April 20 ribbon-cutting ceremony was designed for families and residents. A dedication event was held for external organizations and others April 27. Taking part in the ribbon-cutting in late April are, left to right, Donyale Showers, Twining executive director; Scott Habecker, Diakon chief operating and financial officer; Barbara Valentine, resident; Michaela Howard, memory care patient-care manager; Sonja Rozolis, resident; Mark Pile, Diakon president/CEO; the Rev. Erin Maurer, Twining Village chaplain; and Marilyn Boyer, Twining Village independent living resident.